When you save your Adobe Edge Animate CC project, the software creates several different files and folders. 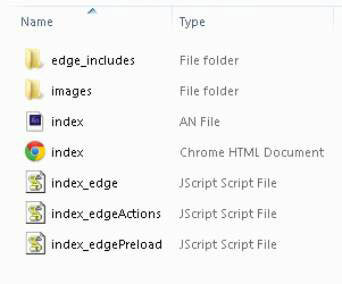 In addition to a special folder for your images, Edge Animate creates an edge_includes folder. Learn about all these folders here along with details about the different files that Edge Animate creates. Even if you are strictly an animator and don’t know a single thing about code, it’s still best that you gain a familiarity with what makes Adobe Edge Animate CC tick. After all, you never know when you may have to dig in to the file and folder structure to find something in particular or to tweak a line of code. Here, walk through the basics, so you can understand what Edge Animate creates as output. This figure shows a sample file and folder structure. Edge Animate creates an entire file and folder structure for you. Edge Animate creates an image folder when you save your composition, which can inadvertently result in you having two sets of the same images in your folder structure. This happens if you put your images in the same folder in which you save your composition, rather than in a separate folder named Images. It’s best practice to place your images in a folder labeled Images. That way, Edge Animate doesn’t create a second set of images in your folder structure. Having two sets of the same images can lead to confusion; especially if you want to go back and edit them later. If you decide you don’t want two sets of the same images in the same folder directory and want to delete the redundant set, make sure you don’t delete the folder that Edge Animate created. If you do, you will find your images missing from your composition. These files tend to be very long, and you don’t need to know much here except that (a) they’re important to your composition and (b) they shouldn’t be tampered with or edited for danger of breaking your composition. It’s highly recommended that you don’t open nor edit the .min.js files found in the edge_includes folder. Unless, of course, you’re trained in such matters.